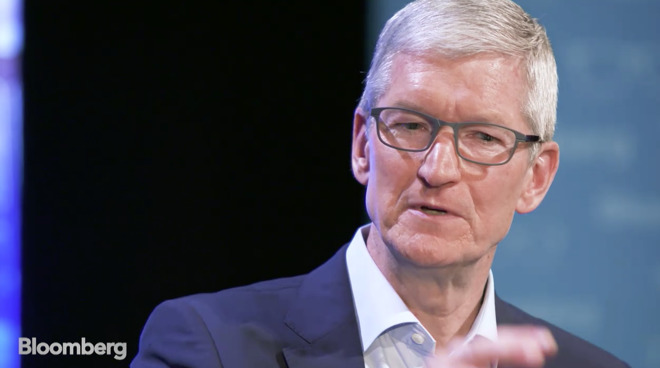 In the interview for the David Rubenstein Show, recorded in May, Cook talked about Jobs' views on collaboration and the working environment, including how the co-founder influenced the design and construction of Apple Park, the company's new Cupertino headquarters. "Steve had the vision that the workplace should facilitate people working together having these common areas that people could work together and run into each other without planning on doing it," Cook advised. "The level of ideas and creativity and innovation that would come out of that would be phenomenal." On meeting Steve Jobs, Cook noted how Jobs decided on directions that Apple would move towards that were "extraordinarily different than conventional wisdom" that was usually selected by other firms. "Many people were abandoning the consumer market because it was a blood bath. Steve was doing the exact opposite. He was doubling down on the consumer at the time everyone else, the conventional wisdom said go put your money in storage and servers.' "
"Talking with him, and the type of questions he asked, were also different. I did, literally before I left, was thinking 'I hope he offers me a job, because I really want to do this.' "
Cook also discussed Apple's current decision-making process that seemingly ignores short-term gains in favor of more distant goals, insisting "We run Apple for the long term." "It's always struck me as bizarre that there's a fixation on how many units are sold in a 90-day period," said Cook. "We're making decisions that are multi-year kinds of decisions. We make it very clear that we don't want to run the company for people who want to make a quick buck." The interview also touched on Apple's philosophy regarding privacy, with Cook insisting it was viewed as "a fundamental human right." Calling it as important as "some of the other civil liberties that make Americans what they are," Cook notes it is becoming a bigger issue for people over time. "Our tact on this is we take a minimum amount of data from customers... only that which we need to provide a great service," added Cook. "Then, we work really hard to protect it with encryption and so forth."